The Thanksgiving holiday in the US was the trigger for some extremely volatile price action which rippled across all the markets in both Thursday and Friday as traders and investors took time off to go shopping rather than trade ahead of the weekend. As a result the silver market, along with gold, ended the trading session on Friday with a bearish hanging man candle, which followed on the back of the bearish engulfing candle of Thursday, as spot price silver continue to stall at this level. 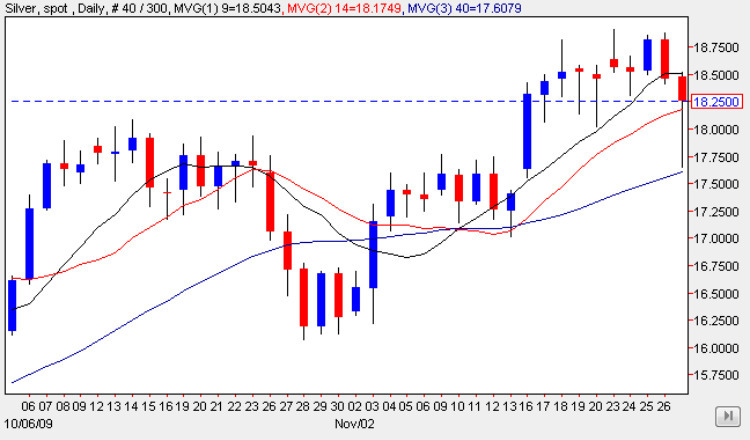 With the strong bearish signal in the daily gold chart, and with the weakness now confirmed in the daily silver chart, it seems that we may see a pullback and reversal of the recent bullish trend for silver prices, with the depth of any such move being governed by the strong potential support now sitting below the current price level, with the $17.75 per ounce level being the first of these areas. Indeed one could argue that the low of Friday found a modicum of support at this level, which would suggest that in the longer term we may well see this price level provide the springboard for a break higher in due course. In the short term however, we should see silver prices fall as a result, but given the depth of potential support below, this is only likely to be a minor technical correction in spot silver. What is the best platform for silver trading? In my view it is Metatrader 4. Download your free demo copy of the metatrader 4 software by clicking on the following link, download metatrader free, and get started today.